Cream Cheese Layer. In a medium bowl, with a mixer set on medium speed, combine the cream cheese and sour cream. Add salt, pepper, garlic salt, dill, thyme, and cracked pepper and mix until well blended. Scoop that mixture into a large 9 x 13” platter. Use a scraper to spread it out and make it even and smooth. Refrigerate it for 30 minutes. Avocado Layer. Put the avocados in a small bowl. Toss them with a small amount of lemon juice (to keep them from turning brown). Evenly spread out the avocado pieces on the cream cheese layer about ¼ inch in from all of the edges. I made an outline first, then filled it in. Tomato Layer. Put diced tomatoes on the avocado layer – about ¼ inch in from the edge of the avocado layer. Onion Layer. Put onion on the tomato layer – about ¼ inch in from the edge of the tomato layer. Bell Pepper Layer. Put bell peppers on the onion layer – about ¼ inch in from the edge of the onion layer. Cheese Layer. 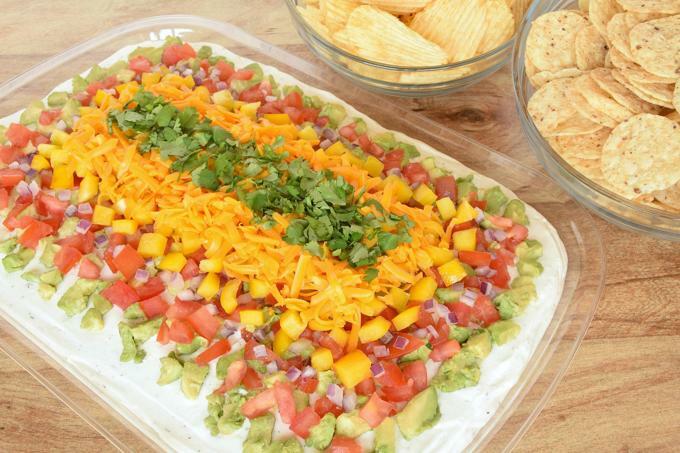 Put cheese on the bell pepper layer – about ¼ inch in from the edge of the bell pepper layer. Cilantro Layer. Put cilantro on the cheese layer – about ¼ inch in from the edge of the cheese layer. Serve with crackers, chips, and veggies.